Quick, convenient and tasty, these amazing snack hacks will save you lots of time in the kitchen and encourage your kids to opt for something healthy! From fun and inventive ways to prepare food, to simple solutions to make snacks portable, to new flavors and exciting recipes here are 12 ideas that will make snack time that much better! This hassle-free idea will allow your kids to help themselves to water whenever they’re thirsty! Popping a magnet on the back of individual cups means they’ll stay stuck to the refrigerator until they’re needed. It’s a great way to encourage your children to stay hydrated, they wont have to ask you each time they need a drink and there’ll be less washing up…it’s a win-win! Make some homemade Go Gurt’s to pack up for school lunches and get your little one’s to snack healthy. By making the yogurt pouches yourself, you can be in control of everything that goes in them – no added preservative, coloring’s or sugars. The kids will love them and you can feel good about giving them something nutritious to enjoy! There’s nothing worse than opening up your lunchbox and discovering that your freshly chopped apple has gone brown! This apple puzzle solution is easy to achieve and will prevent the fruit from becoming discolored…all you need is an elastic band! Forget the painful process of trying to cut your kid’s dinner with a knife and fork because this lazy hack means you can use a pizza cutter instead! It’s much quicker and will cut just about anything into bite-sized chunks that are perfect for little mouths! Jen, over at iheartorganizing.blogspot.co.uk, has put together a fantastic post discussing the ways in which she prepares for her kids to go back into a new school year. She has found these snack stations to be really helpful because you can keep them in the fridge and grab things as you need them, whether it be for packed lunches or for snacks after school. She has a basket for dry goods like crackers, nuts and biscuits as well as one filled with things such as yogurt, fruit pieces and cheese strings. If you’re a parent to a picky eater then you’ll know exactly how frustrating it can be but perhaps all you need is a little creativity. Huffingtonpost.com have provided lots of inspiration for different ways in which you can have fun with food. Kids are much more likely to eat something if it resembles an animal they like or a funny face…you’ll just have to ignore the rule ‘never play with your food’! These no-drip popsicles are a brilliant summertime treat that will stop your kids getting in a sticky mess! Made using Jell-o, they’ll have a different texture to tradition ice lollies but they’ll taste just as good! When kids get in from school one of the first things they’ll usually say is ‘I’m hungry’ or ‘Can I have a snack’? Keep prepared and make sure you always have something on hand to give them by freezing a batch of PB&J sandwiches. These delicious homemade gummy snacks will be a favorite with both kids and adults alike! The kids will love the juicy flavors which come straight from a selection of fruits and vegetables, and all you parents out there will rejoice that there is finally a healthy candy available! The treats are a great way to introduce more gelatin into your family’s diet and you can make them with just five ingredients. Your children can enjoy two snacks for the price of one with these ingenious double-decker snack cups. They’re easy to put together, they’re portable and your kiddo’s will love finding an unexpected treat at the bottom. 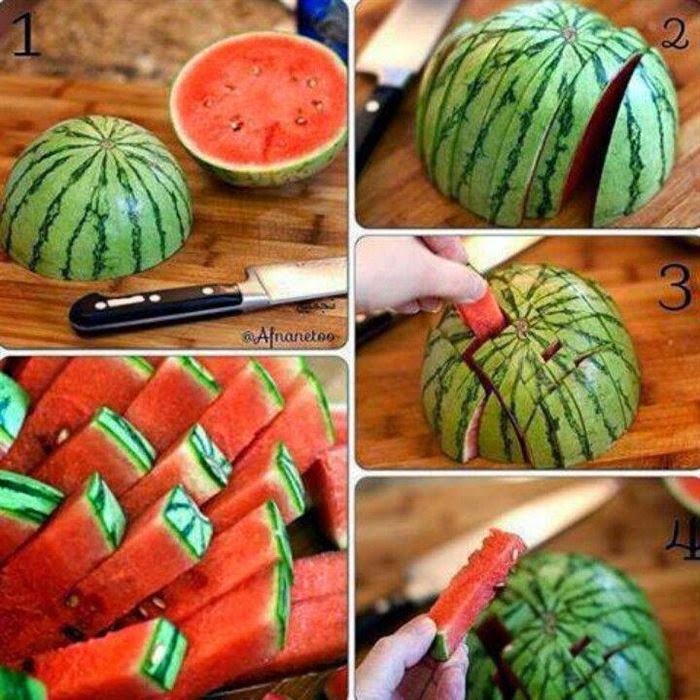 We’ve found a quick and easy way in which you can chop up a watermelon into kid-friendly segments where your little one’s will be able to hold it easily and not get into a mess. Fruit salad ice cream cones are a great way to present something healthy to make it seem more appealing to kids! You can combine a concoction of all different fruits and pop them in an edible cone for a new and novel snack – it doesn’t get much easier than that!